Extremely Versatile – Many applications for the aircraft industry, as well as maintenance and production applications. Safe, Roomy and Easily Moveable. The RollaStep line of mobile work platforms and ladders is designed to give users safe and compliant space to work. The systems are built to last, too. Constructed of durable, yet lightweight aluminum, the mobile work platforms offer corrosion-free longevity and noticeable ROI. And standard features such as full-size handrails, aggressive, non-slip tread and stable designs provide maximum safety. 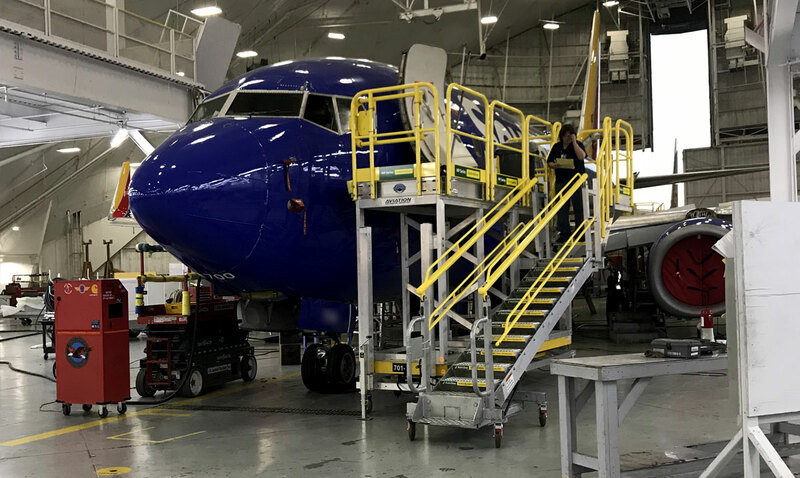 In need of rolling platform solutions for the aerospace & aviation industry? The cantilevered work platform of the C Series allows an operator to safely move onto and/or above tall industrial machinery. It's available in sizes ranging from 8' to 12', and can incorporate an optional cage for off-platform safety. The rolling platform features forklift pockets for quick and easy long-distance moves. The C Series provides operators with a fixed-platform work area above or beside tall industrial machinery, rail cars, trucks and other high machines. The design includes a steel base that adds exceptional counter balance, as well as a very lightweight aluminum upper that minimizes weight. The easy-steer design and no-flat tires allow for single-user mobility even over rough ground. The C Series features a full six square feet of work area, allowing ample room for a user, along with any parts or tools the job requires. The cantilevered platform is self-supporting and extends 2'5" beyond the base of the chassis, providing access to delicate machinery that requires no contact by the platform itself. Plus, an aggressive safety tread covers the entire work surface and provides excellent draining for use in inclement weather. The G Series adjustable height design provides a safe work platform at the correct height for the job. 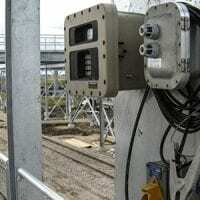 The self-supporting platform allows operators to work in multiple locations without a ladder. The 24-inch-wide steps and platform (6 sq. ft.) self level to present a safe walk and work surface at any of it's height settings. The height of the G Series can be adjusted by removing a simple locking pin—when the desired height is reached, simply replace the locking pin. Gas springs assist in raising the platform, while gentle downward pressure lowers the platform. There are no hydraulics or springs to leak or fail. The lightweight aluminum upper and high-quality casters make this rolling gangway easy for a single user to position. The soft, 360° swiveling casters are easy to roll both indoors and out and allow precise placement around sensitive equipment. The G Series' work area measures six square feet, so it's large enough for an operator, tools and parts. And it features a full toeboard to prevent slips and tool drops. 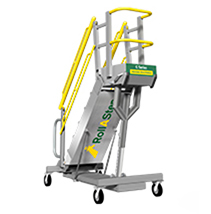 The RollaStep TR Series is a tilt and roll workstand designed to provide space to get the job done no matter where the job may be. The six square feet of platform space safely accommodates an operator, tools and parts—with room to spare. And the lightweight frame and unique side rolling wheels make this rolling platform easy to move and position in tight spaces. The large platform area of the TR Series brings a new level of safety to warehousing and other loading and unloading tasks. It's six square feet of work area allows operators to work at various angles and approaches without repositioning the platform. The TR Series is built with an all-aluminum structure to last inside or outside. The self-draining tread provides an aggressive, non-slip surface on both the platform and the steps, which helps keep ice from building up and allows for safe, all-weather access in rain and snow. 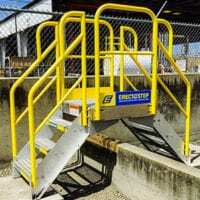 The full toeboard helps prevent slips and tool drops, and the full-length, full-size handrails provide safe operation from any height. On top of that, the sturdy aluminum construction supports a 300-pound load limit without sacrificing mobility. The MP Series adds unparalleled mobility to the workspace of a fixed platform. 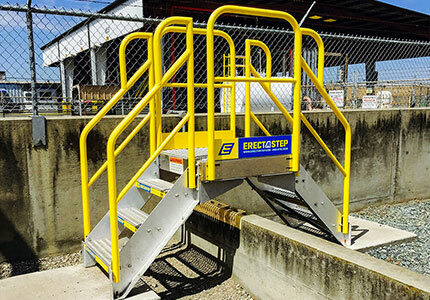 The powder-coated handrails, full-size 45° rise stair stringer and standard-sized steps meet OSHA specifications for mobile platforms. The lightweight aluminum construction and 360° swiveling casters make the mobile platform easily maneuverable by a single person. Removable handrails give the MP series mobile platform versatility to suit almost any application. Remove the cantilever end handrail to access an area over an obstruction or remove an entire side to access a flatbed trailer. 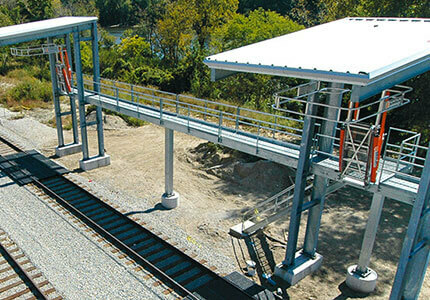 Each handrail slides securely into and out of its retaining sleeve without tools, allowing operators to reconfigure the platform in the field. Moving the work platform is a one-man (or woman) job. The 360° swiveling casters allow the unit to be precisely positioned against even delicate machinery. And the locking casters prevent both swivel and roll, while the soft no-flat tires roll easily over asphalt and gravel.